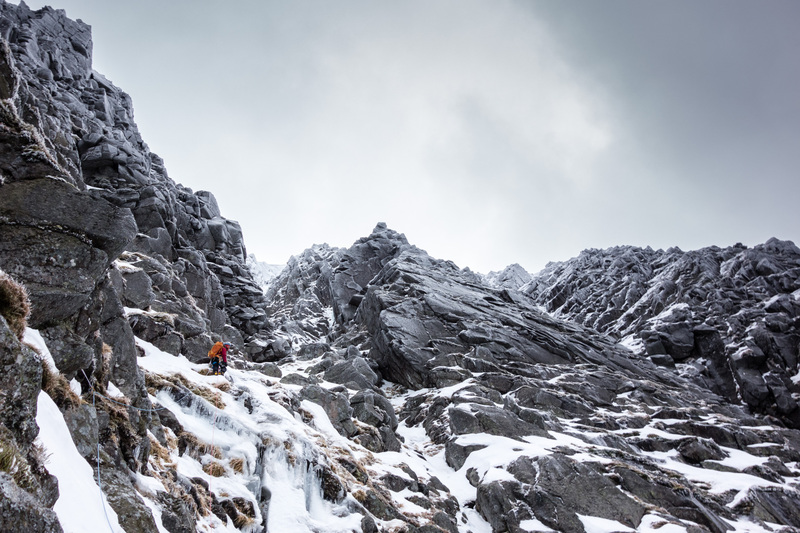 It’s becoming a common theme that my first winter routes are getting later and later and more and more challenging conditions-wise. 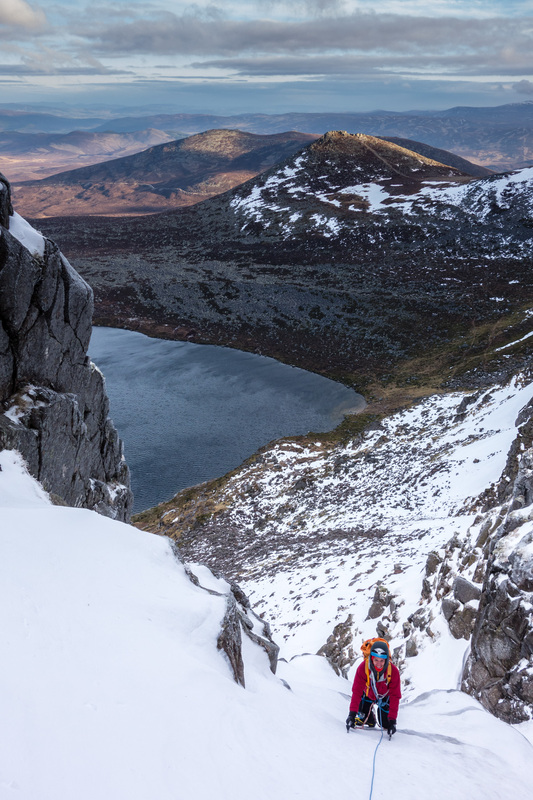 The start to this season has been characterized by short cold snaps and strong thaws and it was right after one such thaw that we optimistically headed into Lochnagar. 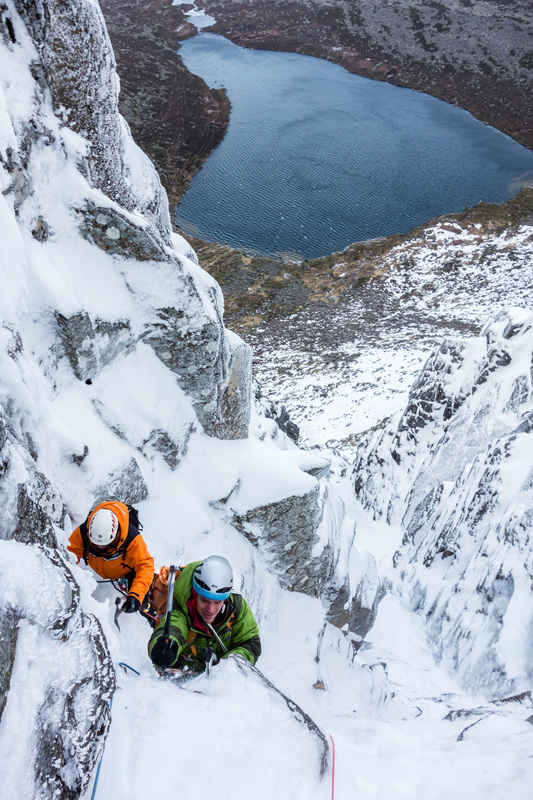 We hoped that an easier route on a buttress more exposed to the wind might have been in acceptable conditions, but on entering the coire it quickly became apparent that wasn’t the case. We had considered the possibility of an easier gully as a back-up route, but we were happy to see that both Douglas-Gibson (V, 4) and Parallel Gully A Right Hand (IV, 4) appeared to be complete. Not knowing whether the upper reaches of the gullies would be consolidated we decided on Parallel Gully A, with a rising traverse in from the left on frozen turfy-ledges to avoid the incomplete first pitch. 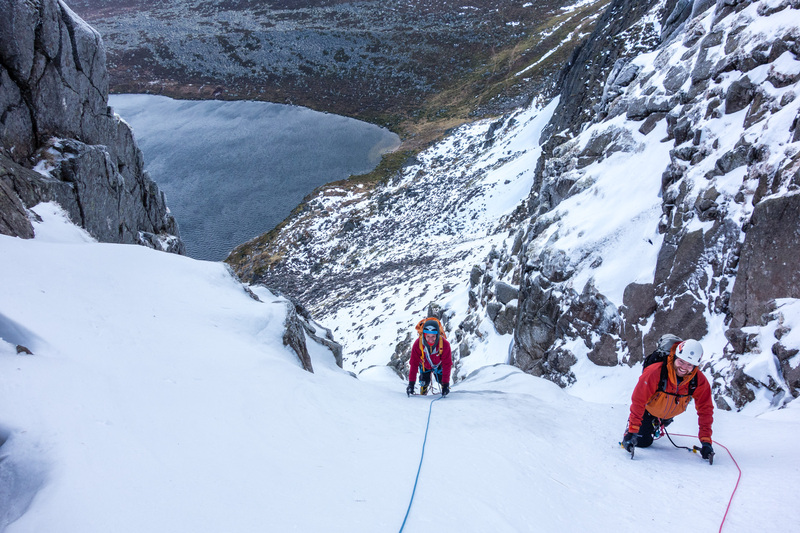 The first few pitches in the gully-proper were very enjoyable – mostly good neve with the odd softer patch and some frozen turf and water ice on the steeper steps. The climbing was extremely bold however, although the belays were acceptable. 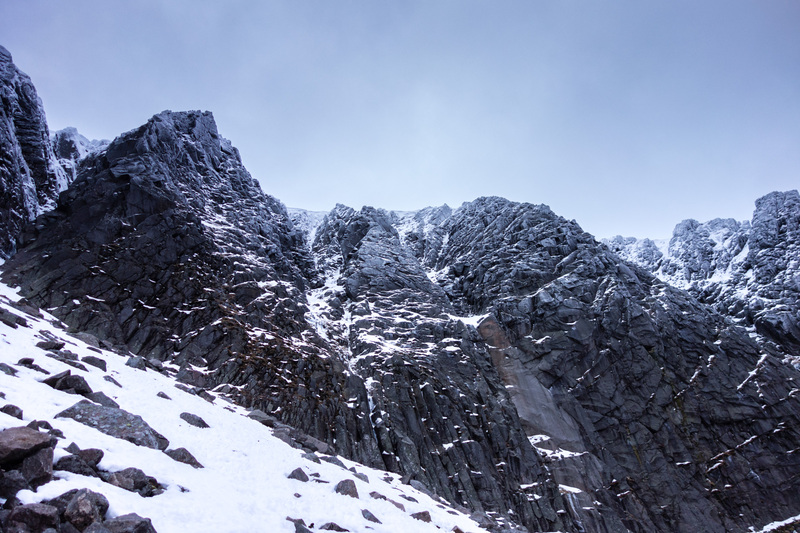 As we entered the upper section of the gully it began to feel a lot more wintery, but you can’t have it both ways this early in the season and this transition coincided with a deterioration in snow conditions. 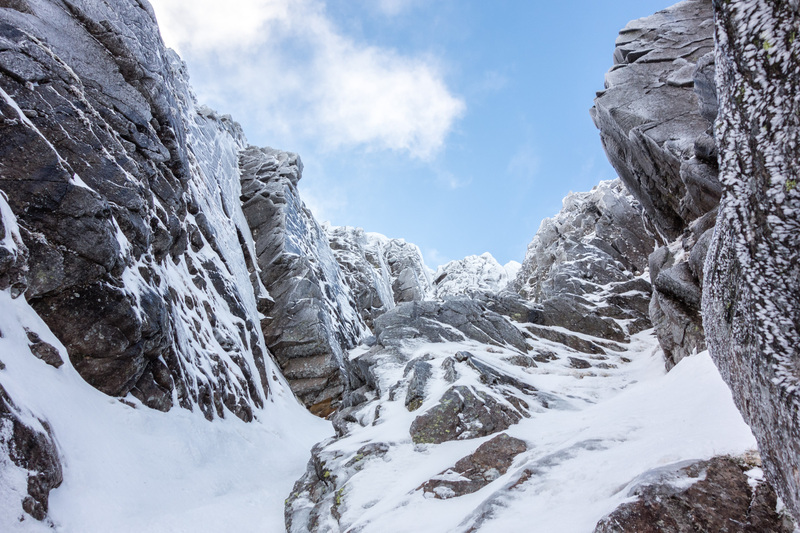 From my experience on Lochnagar, it seems to be fairly typical that even the deepest thaws rarely penetrate the upper reaches of the cliffs and more often than not the snow doesn’t consolidate. 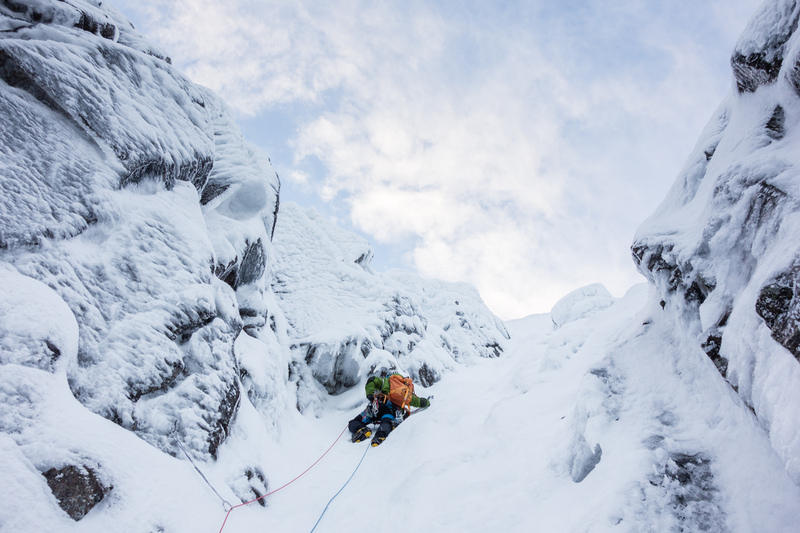 At the head of the main gully, Andy climbed a difficult pitch on thin, unprotectable ice and loose snow to a steepening, where we were faced with a choice of exits. The normal left hand finish looked loose and serious, with an exposed traverse up a ramp to the cornice. The right hand finish was far steeper, but more in the way of rock features enticed me up with the chance of finding protection. Aware that this section is graded for ice, I knew I was in for an interesting experience. Deep, cruddy snow meant laborious and scary progress, with a lot of time and energy expended to dig out the runner placements. Thankfully, there was just enough consolidation to make pulling over the rounded bulges possible. Even excavating a decent belay was an ordeal, but as I relaxed contentedly I began to feel for Andy, given what was looming above. The cornice didn’t appear to be large, but getting there was clearly going to be very insecure and basically devoid of gear. Luckily, Andy is made of far sterner stuff than I and he proceeded upwards confidently. Good work lads! 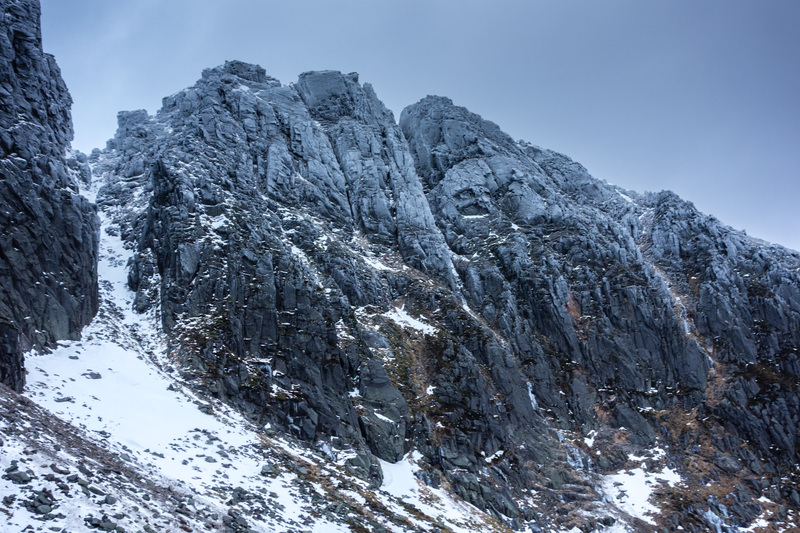 Six pitches for first winter route of the season is good going. 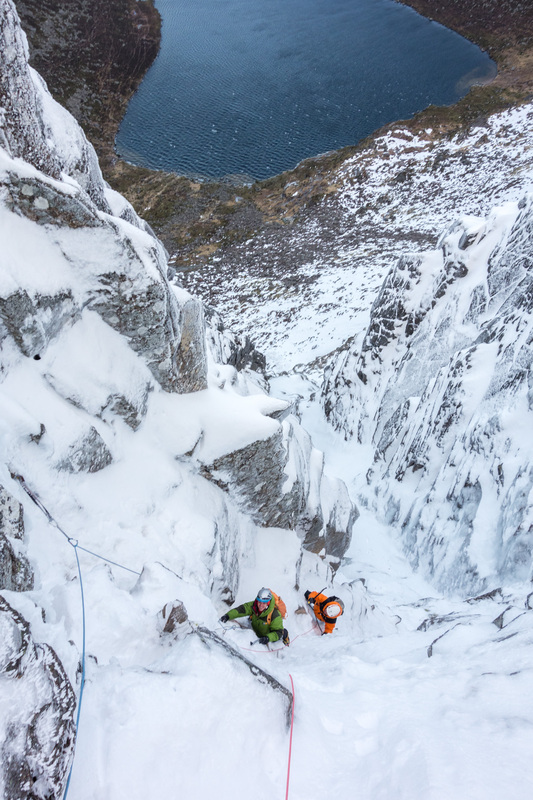 Pictures of Andy and Jamie seconding pitch five are stunning- sense of scale gives me sweaty palms. Love this Dave. Brings back memories of climbing this with Mark a long time ago. I remember the final pitches being a battle!